It’s Breast Cancer Awareness month! Which means our shelves will be a little more pink than usual. Today I scoured the world for some pretty and perfectly pink presents. They work great for women that simply want to support breast cancer, or those that are undergoing (or have survived) their own battles. All of today’s featured items are in support of Rethink Breast Cancer, a great, young, Canadian organization that targets those under 40 for prevention as much as research, treatment, and support. Each year they team up with majorly awesome brands to produce some truly one-of-kind, covetable items that not only look great, they’ll make you feel great for buying them. Pink is the new red – for your nails anyway. It’s a girly and polished choice that’s also a little more modern and appropriate for any age. 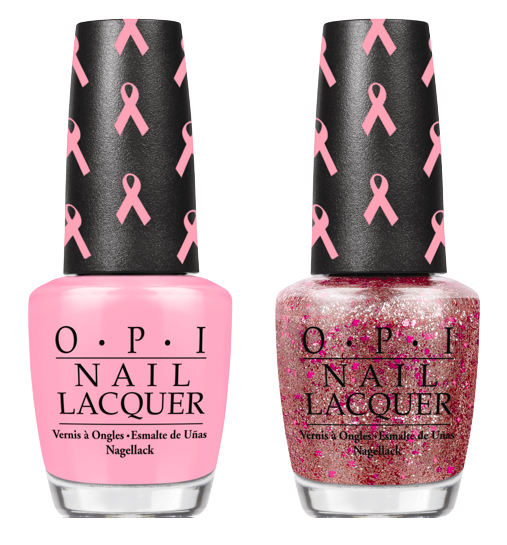 My most beloved nail brand OPI is releasing a two-pack of pretty polishes in classic glossy pink and raspberry-flecked glitter, in support of breast cancer awareness and research. Stay tuned – this one might not be in stores just yet, but be sure to ask your local beauty salon / shop to stock it so you can grab bunch as fab Christmas gifts! Got a friend training for a breast cancer run or marathon? Give her this sporty-inspired watch from Roots, featuring a silicon band, luminous hands, and a motivational phrases. Not so sporty? 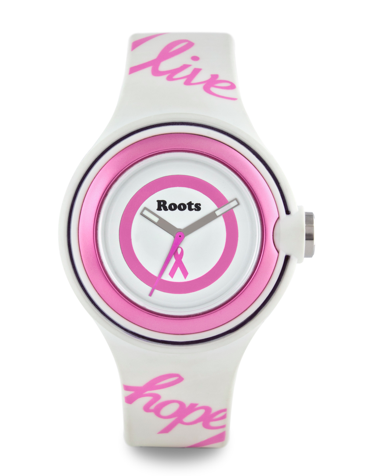 This is one of two fab watches Roots has released to support Rethink. Be sure to also check out the elegant nickel chain-band Contessa watch, priced at $110. Polish up those locks with this amazing leave-in conditioner that instantly smoothes frizzies and mends split ends. Formulated with a blend of humectants (which helps your hair retain moisture) and Abyssinian Oil, this is a thoughtful choice for a friend that’s actually gone through cancer and is regrowing her hair, or simply for the beauty-obsessed on your gift list that would also love to support a great cause. Hurry though – this one’s only in salons till the end of October! Want a way-cute housewarming gift with a totally practical purpose AND a heartfelt message behind it? 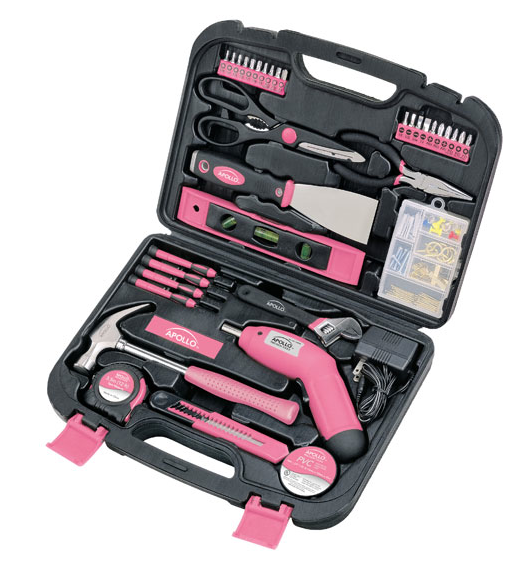 Grab these pink-hued tools for your DIY friend that’s just bought her first home or apartment. She’ll have fun hanging up pictures and spackling walls, you’ll have scored a great-priced gift that also donates a portion of every sale to breast cancer. Available year-round, so even if that to-buy event isn’t right around the corner, you know you can stock up. Not to prey on your emotions or anything, but overcoming cancer is no small deal. And while this sparkly crystal charm may be petite, its emotional significance is heavy – a reminder to the woman you give it to that she’s still here because she’s strong, and has a wonderful support network behind her (including you Mr or Mrs. Gifter!) This year you can also scoop up limited-edition Swarovski breast cancer pendants & pens – but stock up before October 31st! Love all of these gifts listed and the cause they all support. Great post! I will definitely be buying that tool set! Those nail polishes are too cute will definitely be keeping an eye out for them.